The photovoltaic data logger MacSolar is the ideal hand-meter for solar engineers, architects and hobby solar installers as a photovoltaic data logger on-site. This Photovoltaic data logger enables determining the light intensity and the temperature. Thus the photovoltaic data logger calculates the energy yield and several other parameters (electricity, voltage, at working point) with very high accuracy. Thus a statement about compilation and construction of a photovoltaic complex is enabled due to the photovoltaic data logger. The measurement of light intensity is performed via monocrystalline silicium solar cells that can additionally provide the operation energy for the photovoltaic-data logger. The processor integrated in the photovoltaic-data logger ensures the preservation after calibration of every photovoltaic-data logger in the solar-simulator. In all measurement modes eligibly the measurands Ptot (W/m2), Pn, Un, In (in %) or T (in °C) will be displayed at the photovoltaic-data logger. The measuring data stored in an internal storage of the photovoltaic-data logger can be transferred to a computer via the special software. 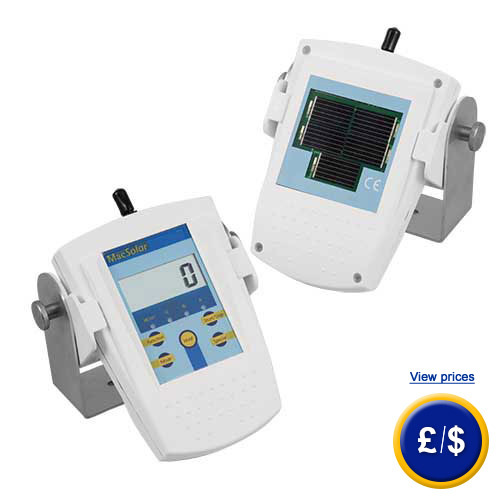 This photovoltaic data logger was designed for on-site operation and therefore has a weather-resistant and robust synthetic enclosure. Its compact measures allow a comfortable one-hand operation. If you have further questions concerning the photovoltaic data logger, take a look at the following technical data or call our hotline: UK customers +44(0) 23 809 870 30 / US customers +1-410-387-7703. Our technicians and engineers would be pleased to inform you concerning photovoltaic data logger and all other products in terms of regulation and control or scales and balances by PCE Instruments. - Up to 19.000 measuring values storable. With the photovoltaic-data logger MacSolar a direct measurement of light intensity and temperature can be performed at a defined position. Those measuring values can be consulted amongst others for checking on degree of efficiency of PV modules or solar thermic facilities. At the display of the photovoltaic-data logger the optional adjusted indicators light intensity and module temperature are shown. The values can be temporary stored by pressing the HOLD key. With the actual measured indicators light intensity and temperature the Photovoltaic-data logger calculates internally the module temperature that arises from an adjustable installation of PV modules at the Photovoltaic-data logger. The image shows the module- excess temperature of a PV-isolation glass façade during the radiation (at 25°C ambient temperature). For measurements during longer time periods the photovoltaic-data logger MacSolar is equipped with an internal arithmetic-average-function and a data logger. In the following some typical measurement applications are displayed, that can all be implemented with the photovoltaic-data logger. For meteorological purposes the determination of global radiation, mostly in horizontal position, for a long time period is necessary. Therefore the photovoltaic-data logger MacSolar is to be positioned accordantly by means of the montage frame included in delivery. Equally the photovoltaic-data logger is applicable for long-term measurements of surrounding temperature. In that case the sensor has to be applied in a shadowed position. For determination of solar radiation intensity and temperature special locations, like e.g. forest, fog zones, interiors, positions with complicated clouding, are predestined locations for the photovoltaic-data logger. Normally in those cases the estimation of the output for longer terms, e.g. a year, plays an important role. Therefore the software-simulation program of the photovoltaic-data logger is useful, but has to be partially on large expense and with rough estimation adjusted to such situations. In contrary more accurate measuring data can be achieved due to comparative measurement with two MacSolar photovoltaic-data loggers: one of those has to be installed at the specific measuring location and the other reference device horizontal in the open. The data gained by the reference photovoltaic-data logger has to be standardized after the measurement to meteorological weather data that is existent over a long-term period (e.g. 10 years). Then the measuring data that the other photovoltaic-data logger gained at the specific location have to be multiplied with the standardization factor in order to gain the efficiency prognosis for the measured time period. A special application of the photovoltaic-data logger MacSolar is comparative measurement with several meters that are installed at different locations. This method is especially adequate for objects, for which several locations are provided to install the solar plant and no explicit conclusion about the most beneficial location is available (e.g. south-east, south-west, roof partially shadowed). Usually such tasks should be performed by means of software simulation programs. Despite of this in multiple cases a checking of the actual conditions via the photovoltaic-data logger serves best as well, especially in cases, where a simulation would result in rough inaccuracy (e.g. in case of complex shadowing). As a matter of principle several photovoltaic-data loggers MacSolar are used simultaneously for the concerning location. Even in this case aside from data logger- measurements for a quick on-site check, arithmetic averages of the single devices can be compared, too. The photovoltaic-data logger recognizes the whole solar radiation due to its calibrated PV-cell, i.e. 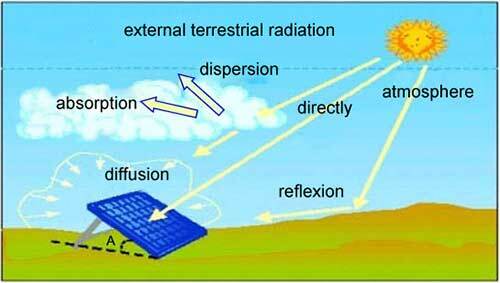 direct radiation as well as diffuse radiation of the atmosphere. The largest share of energy of solar radiation that reflects from the earth's surface lies in the infrared visible part of the spectrum due to the fact that ultraviolet radiation is absorbed by the atmosphere. Solar radiation diversifies due out the year caused by the varying angle of the sunlight streaming between summer and winter. With the full version of MacView the data can be read-out from the MacSolar and evaluated afterwards. MacView 2.0 displays the data measured with MacSolar graphical and tabular. Above all the radiation values gained with MacSolar can be used to generate an efficiency prognosis of PV-systems. The new intuitive interface alleviates working with MacView from the beginning. The MacView full version will be delivered with an extensive solar module (>26,000) and power inverter database (>5,000). The data will be transferred via a HID cable from the MacSolar storage to a computer. The wired interface allows a quick and interference-free data transfer and also controlling the MacSolar from a computer. adjustable factors and efficiency characteristics. - Export of measuring data in an excel file.